Gremolata is an Italian flavor combination consisting of grated lemon zest, pressed garlic and chopped parsley. The garlic fragrance is released in heated olive oil which is then combined with the recipe ingredients. This will be topped over grilled rib-eye steak, grass fed, of course. For steak, season with salt and pepper. In a large grill or stainless steel skillet heat oil to medium-high. Place steak onto skillet, reduce heat to medium and cook undisturbed 4 minutes each side until browned. If using a stainless steel skillet, deglaze skillet with a splash of red wine vinegar. Turn off heat and immediately add 1 tablespoon vinegar and scrape the browned bits. Remove steak from heat and transfer steak to a plate. For gremolata, have a small mixing bowl ready. Wipe out skillet and add oil. Turn heat to low. Press garlic into skillet and heat 30 seconds or until garlic is fragrant (do not brown or burn garlic). Pour garlic and oil into mixing bowl. Zest entire lemon and juice the lemon to measure 1 tablespoon into bowl. Add chopped parsley. Add salt to taste and mix well. 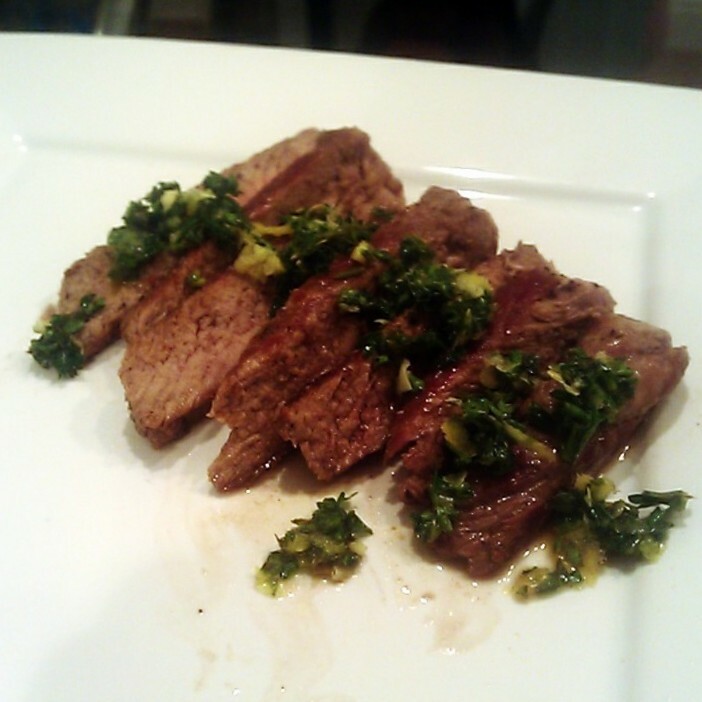 Top steak with gremolata and serve. Better option: slice steak into fajita strips and heat quickly in the grill before serving, deglazing with red wine vinegar if necessary. I love everything that I’m reading…I don’t think I’ve ever heard of gremolate but now I’ve got something that I absolutely have to try! How true for me too! I spend 29 minutes standing there trying to figure out where I’ve got everything stored now. Gremolate is so fabulous! We once went to a restaurant that served it with bread for free, even before you ordered your meal. They ended up closing, probably because they spent too much money on lemons and parsley! I love gremolata, it’s wonderful on meat. So simple and delicious. Love how simple this sounds – would be a great dinner party meal!